BDS Design Build Remodel brings you nearly 15 years of experience remodeling basements in Chicago’s North Shore. Remodeling your basement is an excellent way to add value to your lifestyle, and improve your home’s equity in one project. Basements not only have the ability to add extra storage, but can be used for a multitude of uses, including a workshop, an office, or an entirely separate living space. Basements are also a great way to add space without sacrificing the square footage of your yard. Remodeling an unfinished basement, or adding additional useable space to your existing square footage requires a thorough understanding of the owner's needs and unique vision for their space. That’s why we will typically begin understanding our client's specific needs. What would you like to do with this space? Will it be a media room? An office? A teen-friendly space? An in-law suite? Multiple uses? 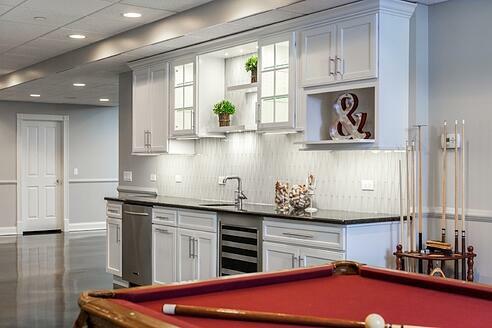 With basement remodels, the options are endless. We understand that each home requires a unique solution. Due to our design-build process, we have the unique opportunity to present a plethora of options in the design phase, taking into consideration any needs that may come up during the construction phase. When the time comes to renovate your basement into the space of your dreams, we have the proper steps in place to ensure great communication every step of the way. Our finely-tuned design method is a step by step process that involves a seamless collaboration between our design and construction teams. Keeping you informed every step of the way, our in-house design team works with you to execute your ideas and develop your vision. From there, our design and production teams work together to seamlessly manage your project, allowing for complete transparent communication at every step. With over 15 years of experience designing and renovating basements in Chicago’s North Shore, we have worked on nearly every type of basement remodel. From expansive media rooms, to wet bars and dance floors, we have the experience to bring your vision to life. We invite you to take a look at our past remodeling projects to see what we can do to transform your basement.